How many hours a week do I need to spend on my allotment? I’ve just been offered an allotment. How many hours a week do I need to spend on it? The size of your allotment. The larger plots at Welshmill are around 125 square metres. Some of them have been split and are half this size. How intensively you cultivate it. Are you going to grow successional crops such as a range of salad leaves in the summer? Are you going to grow crops over the winter such as broad beans and Japanese onions? This will obviously take more time than if you stick to runner beans and potatoes and a few courgette plants. Buying in plants can take less time because it removes some of the unpredictability from growing from seed. How you plan your plot. If you’re going to make raised beds and paths and build new compost bins you need to factor the time in for building them. The condition of your plot when you take it over. Weed clearing, digging and re-modelling all eat away at the hours. The standard to which you aspire: growing show standard produce is obviously more time-consuming but can you live with some weeds or does your plot have to be immaculate? Stop beating around the bush and answer the question: how many hours do I need to spend on my plot? While you could probably get away with this on a half-size plot in the winter it wouldn’t be enough in the main growing season, especially on a full-size plot which would be covered in weeds if you only spent two hours a week on it. A quick survey of allotment holders produced the following results. From November to February, people spent between 2 hours and six hours a week cultivating their allotments. While from March to October they spent between five and twelve hours a week. So that works out at between 24 and 52 days a year, assuming an 8-hour working day. says there are methods that “will enable you to get the best results in half an hour per day, or even less.” And that works out at 23 days a year. So, how many hours a week do you spend on your plot? How long is a piece of string? I use my allotment mostly for the crops I don’t have to tend very often – onions, spuds, carrots, leeks, garlic, squash, perpetual spinach…… and it has perennial artichokes, gooseberry and currants…. The things I want NOW for lunch I grow at home….. So I have bursts of activity – 2 or 3 reasonable days maybe, then nothing for 2 weeks. 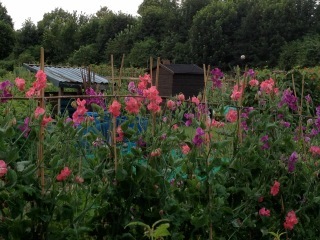 This means I miss out on the social side of allotment growing, which is important (as I am so irregular). Who knows, as I grow older, maybe more time on the plot?